But not at the Nurburgring. It’s been a landmark year for lap records. The Porsche 911 GT2 RS smashed the Nurburgring lap record for the fastest production car, beating the Lamborghini Huracan Performante which held the title for just a few months. Let’s also not forget the Nio EP9 which set the fastest time for an electric car. Alfa Romeo also set the fastest SUV time at the Green Hell in the Stelvio Quadrifoglio. And now the new 600-hp, 4.4-liter V8 BMW M5 has set a lap record for the fastest four-door production sedan – but not at the Nurburgring. Instead, the record was set at the Shanghai International Circuit in China. Behind the wheel of the new F90-generation M5 was BMW factory driver Bruno Spengler, who won the DTM title back in 2012. This was the first time Spengler had ever driven around the F1 circuit, and despite the cold and damp conditions not being ideal, he clocked an impressive lap time of two minutes and 22.828 seconds. That makes the new M5 the fastest four-door sedan to ever lap the Chinese circuit, beating the previous record by five seconds. The M5 used in the lap was a stock production car with no modifications. “Besides power and torque, I suppose the secret of this car is its excellent balance,” said Spengler, whose DTM career includes 15 race wins and 48 podiums. “It’s very agile and responsive, and the increased traction with the four-wheel drive makes this car very easy to drive. It is also lighter than the previous generation, which plays an important role on a track like this.” We’re not doubting Spengler’s skills at the wheel, but his inexperience of the circuit and the less than ideal conditions are a testament to the M5’s capabilities. 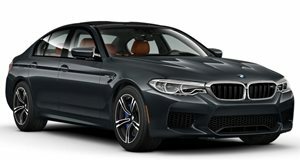 Hopefully BMW will attempt a new Nurburgring sedan lap record in the M5 soon where it will need to beat the Alfa Romeo Giulia Quadrifoglio’s time of seven minutes and 32 seconds.